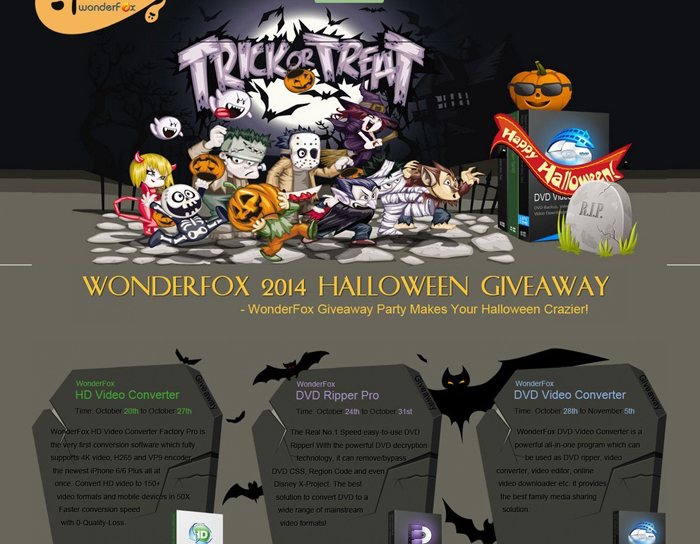 WonderFox 2014 Halloween Giveaway starts in worldwide on the 20th of October. We prepared special Halloween giveaway freebies and up to 70% off discounted Halloween special offers. A free pack of Halloween gifts would be offered to customers who visit our event page. This HD conversion software helps users convert video from Standard-Definition (SD) to High-Definition (HD) like HD MP4, HD MKV, HD AVI, HD MTS, HD TRP even Ultra HD 4K standard, and it also supports the newest encoders H265 (HEVC) and VP9. 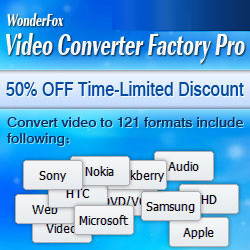 WonderFox DVD Video Converter provides one-stop total solution to rip DVD (released by Disney, Paramount, Sony, etc), convert video to nearly all the formats and devices, download online video, edit and play video with excellent performance. You'll be entitled to the crazy 70% discount offers as long as you play the “Trick or Treat” mini-game. It will save a total cost of $70 for you. WonderFox Video to GIF Converter is a simple and quick video to GIF software on Windows, and capable of converting video saved in any popular format to animated GIF. A wide variety of special effects will bring more fun in the video to GIF conversion process. Once you purchase any of the WonderFox Halloween products, you’ll be offered a mysterious Halloween gift. Discover it for yourself! WonderFox Halloween Promotion and Giveaway is valid before November 6. Time is limited. Hurry up to join us!